Finally activities of the first edition of D.RE.A.M . Academy are on, the advanced international training program made in Italy, promoted and organized by Città della Scienza in close collaboration with leading universities and research centers of Campania Region, including the University of Napoli Federico II, University of Campania Luigi Vanvitelli Studies, CNR and the Italian Institute of Technology. This morning main issues have been introduced such as digital manufacturing (3D printing, robotics, electronics preparing participants for the challenges of Industry 4.0. 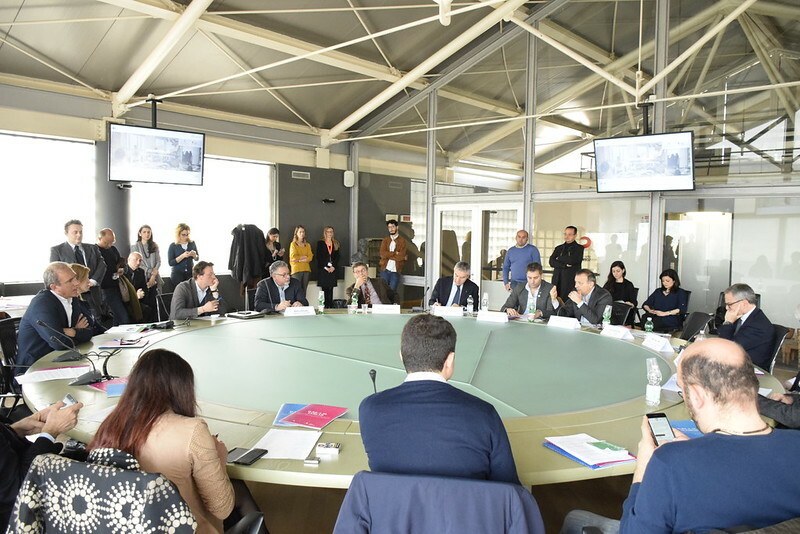 As part of Città della Scienza FabLab, funded by the Ministry of Education – the Academy represents one of the main new advanced training center. At the meeting: Vincenzo Lipardi, General Secretary, Città della Scienza; Amleto Picerno Ceraso, D.RE.A.M. Manager FabLab, Città della Scienza; Piero Salati, President of the Polytechnic School and Basic Sciences, University of Naples Federico II; Furio Cascetta, Professor of the University of Campania studies Luigi Vanvitelli , Andrea Tomasi, President of Engineers Architects Inarcassa Foundation, Alfredo Morabito, Director Promotion Coopfond, Mario Catalano, President of Legacoop Campania, Ambrogio Prezioso, President of the Union of Industrialists Naples, Conclusions Ministry for Education of Campania Region, Chiara Marciani. Four strategic industrial sectors: biomedical and pharma, fashion & design, architecture and building for unconventional environments, cultural and museum installations assets. The program, in its first edition, will take place from March 27th 2017 to December 15th 2017, and is implemented with the support of Legacoop, Coopfond and Foundation Engineers Architects Inarcassa. The Academy will provide selected participants the opportunity to acquire high profile technical and design skills on advanced manufacturing, and provides that participants come to the end of the course with the creation of its own prototype. Academy aims to contribute to form innovative expertizes, highly sought by the international labor market but difficult to find, that can design and produce with new digital technologies. It offers trainings to effectively engage in enterprises, the new paradigms of design, production and distribution of advanced manufacturing. At the same time, a powerful tool to create new products and patents can generate new startup, in line with the educational strategies of the Department of Education of the Campania Region. The Academy has a teaching staff coming from the US, Germany, Austria, Switzerland, with professors from the world’s leading centers such as NASA, the architectural design firm founded by Zaha Hadid and other prestigious universities, international scientific and professional facilities. 13 between Campania and Lazio (including 7 with a scholarship offer from Legacoop, one with a scholarship offer from Inarcassa, 5 with own funds).